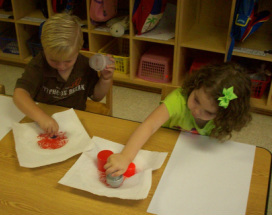 We use The Creative Curriculum, developed by Teaching Strategies, Inc. The Creative Curriculum provides goals and objectives in four areas, including Social/Emotional Development; Physical Development; Cognitive Development; and Language Development. The list to the right shows the various categories for which we have goals and objectives. If you would like more information about how our curriculum is implemented in the classroom, we have copies of A Parent's Guide to Preschool that are available for checkout through our director.